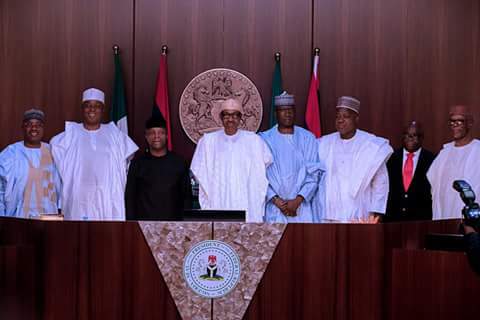 President Muhammadu Buhari has directed his key finance officers to sit down with representatives of Nigeria Governors Forum to determine how much of their unpaid debts can be released to them before Christmas. Responding to pleas by the governors who came to the State House on Monday under the leadership of Abdul-Aziz Yari, the Chairman of the Forum asking that the President give a commitment to pay all outstanding debts owed them from London and Paris Club deductions to ease their financial hardships, President Buhari said he was not averse to the payments so long as the treasury can afford it and the economy will not be destabilised. The Governors informed the President that they wanted his commitment on this repayment so that they could factor the money into their 2018 appropriation plans. As such, he remarked, “I will not be saying much because the responsible ministers are here: Finance, Budget and Planning and the Central Bank of Nigeria. I request you to appoint your own team to come and sit down with them. Following the presentation by the other Governors – Nasir El-Rufai, Kaduna; Ogbeni Ra’uf Aregbosola, Osun; Udom Gabriel Emmanuel – Akwa Ibom State and Owelle Rochas Okorocha, Imo State took turns to commend the President for caring for the States and their workers; for his equal treatment of the States irrespective of political party differences and for approving these refunds to the States going back to 2015 which according to them, previous leaders chose not to give attention to.